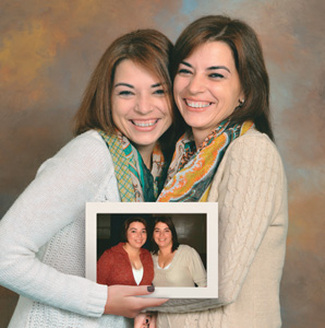 Twice the joy — that’s the vibe you get when speaking with identical twins Angel Schaffer of Greenwich Township and Diane Hitchner of Pennsville, who lost nearly 200 pounds between them. “Life has changed for both of us,” Angel says. “Definitely for the better!” Both women underwent sleeve gastrectomies performed by Harish Kakkilaya, M.D., medical director of the Salem Surgical Weight Loss Center (SSWLC). The sleeve gastrectomy procedure not only provided the twins the weight loss they were seeking, but also reduced medical issues, such as high blood pressure and acid reflux, and reduced the severity of their thyroid and back issues. It wasn’t that I was in bad health considering the weight I was carrying, but things just started to add up. I was diagnosed as diabetic with sleep apnea, had borderline high blood pressure, and a number of aches and pains – all of which related to my excess weight. Before I knew it my health started to slowly spiral out of control. I was always an active person despite my weight. I enjoyed backpacking and playing golf. But I couldn’t help but notice that my performance was declining, my knees were constantly sore, and I herniated a disc in my back. It became painfully clear that I was carrying too much weight. I had never heard of weight loss procedures until I read an article about the professional golfer John Daly. I read that he underwent a lap band procedure and that he lost a lot of weight. That planted the seed of an idea for me. I began to do research on weight loss procedures, reading forums and other people’s experiences. and it definitely was a process. The program at MHSC was comprehensive with lots of support – nutritional educational classes, physical workups that included respiratory and cardiovascular exams, psychological tests, sleep tests – I felt the program left no stone unturned. Having this procedure was a major decision for me. There were times I asked myself, ‘Should I or shouldn’t I?’ But the information given along the way really helped me with a clear path to a decision. Dr. Kakkilaya was really great. He gave me all the information I sought and answered all the questions I had. He gave me background on both the lap band and the sleeve gastrectomy procedures so that I could make an informed choice. What I liked about both procedures was that they were done minimally invasive or laparoscopically. I decided to have the Sleeve Gastrectomy procedure because I felt that it gave me the added benefit of appetite suppression. Also, I didn’t like the fact that the lap bands needed adjustment over time. The procedure involved an overnight stay and I was gone by next morning. The nurses and support staff –everyone at MHSC made me feel comfortable. Today, I definitely feel better all around – mentally and physically. My blood pressure is back to normal, my diabetes is gone, and I am sleeping better. I am playing more golf and feeling better while doing it. I notice I have more stamina – if I am on the range, I can hit more balls without becoming too tired. I am working out more. My energy is up and my overall outlook on life is better than ever! That’s how Maureen Ashfield of Carneys Point describes her life since undergoing weight-loss surgery. “That’s not an exaggeration,” she said. Losing 125 pounds and subsequently being named 2012 Mrs. New Jersey is certainly no exaggeration. Ashfield credits the decision to undergo bariatric surgery – specifically a sleeve gastrectomy – as the reason for the new direction in her life. The procedure was performed by Dr. Harish Kakkilaya, medical director of the Salem Surgical Weight Loss Center at The Memorial Hospital of Salem County. 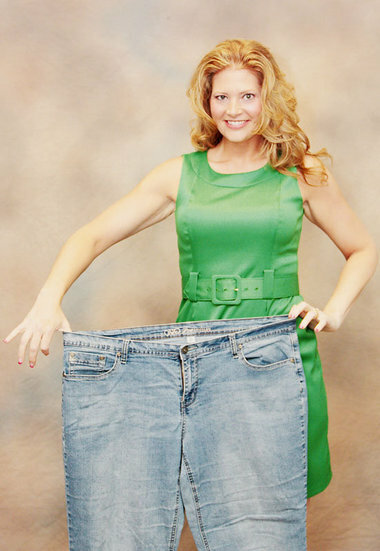 When her weight ballooned to 275 pounds, she knew she had to do something. Ashfield tried several diets, but none of them worked. So, Ashfield began researching weight-loss surgery as an alternative to dieting and as a way to help cure her 10-year battle with weight gain. Once she decided to move ahead with the surgery, she attended the monthly free seminar and networked with both former and present patients to gain a better perspective on what the experience would entail. Since the surgery, Ashfield has regained her confidence to do things she thought were things of the past – like competing in pageants again. As a teenager and into her 20s, Ashfield competed in several local pageants. She was named Miss Salem County, leading to entrance into the Miss New Jersey pageant twice. However, with the birth of her two children – daughter Hannah, 7, and son Hunter, 4 – she gained weight over time and because of hormonal imbalances could not shed it. She stopped competing in pageants in part because of her weight and also because of the responsibilities of being a young mother and a full-time photographer (she owns and operates the Memory Keeper Photography studio in Carneys Point). But she stayed connected with the pageant world by serving as director of the Miss Heartland Scholarship pageant for the past eight years. My story is probably a lot like yours- as I grew older, my weight continued to increase despite attempts to diet and exercise. Each time I lost some weight, I would find that eventually I would gain it back and then some with an inexorable increase in my BMI. I had friends who had bariatric surgery and had lost considerable weight. I finally decided to investigate this option and spoke with Dr. Kakkilaya about the procedure. I had friends who had a Roux-en Y gastric bypass and I was not prepared for that kind of surgery nor the risks associated with it. Other friends had Lap-Band procedures and seemed to do well with them and that was my initial decision. While going through the process of the pre-operative activities, I began to do some research on the sleeve gastrectomy procedure and decided it offered me a better option than the Lap-Band technique. I travel frequently and am gone for extended periods of time thus the required post-operative appointments for Lap-Band fills was going to be a problem. Additionally, the internet search I did provided me with case studies showing better weight loss with the laproscopic sleeve gastrectomy procedure compared to the Lap-Band. One caveat should be addressed in that the laproscopic sleeve gastrectomy is a relatively new procedure and thus there are few long term (3 years or more) studies done which can compare the total weight loss over time when compared to Lap-Band or Roux-en Y procedures. My insurance and the paradigm used by Dr. Kakkilaya required a pre-operative education process in which we were introduced to the bariatric technique, advised about the techniques needed for the surgery to be successful and given general dietary counseling. I had the surgery done on January 26, 2011 at the Salem County Memorial Hospital in Salem, NJ. The surgery and recovery really was painless. I was given the option of patient controlled analgesia but in reality I didn't need it. I was sore from the several incisions on my stomach but no more so that I would be if I had done a strenuous workout with abdominal crunches. I was in the hospital for two nights but at no time was I uncomfortable. Upon release, I went home and within a few days I felt no discomfort at all from the surgery or the incisions. · Following surgery, the weight loss for the first several weeks was astounding. I would lose 7-8 pounds a week without any effort on my part. This quick weight loss stopped after about 4 weeks but I lost close to 30 pounds in a faster period of time than I ever had done before. · One of the most surprising things to me is the absence of the hunger sensation. Prior to surgery, if I were not to eat lunch I would begin to get intense hunger pains in early afternoon. At times the focus on the hunger would be all consuming and I would go to the candy machine at work and buy junk food which only added to my problems. After surgery, I can eat a small breakfast and not be hungry until the evening meal. · The reduction in the size of my stomach has radically changed the way I eat food. I don't have the capacity I once did and it was (and still is) a learning experience when it comes to portion size and the amount of food I eat. Additionally, I have learned to eat more slowly and to chew my food more than I used to do prior to surgery. I would say one of the biggest learning experiences I had was in how to chew and eat my food. · In addition to the loss of hunger, I seem to have lost a lot of my sense of thirst. I have to be aware to push fluids each day and be aware of becoming dehydrated. · I have found that my taste for food has changed. I used to eat a lot of junk food and now I find that I have lost the desire for much of that. McDonald's Big Macs have suffered a fall off in sales following my surgery. · I don't seem to tolerate alcohol as well as I used to. I do like martini's but find that I no longer can enjoy them as frequently or in the quantity I once did. On that, there are both pluses and minuses. Alcohol contains a lot of empty calories and reduction in intake certainly helps me reach my goal of weight loss but I do miss the Bombay Sapphire martini's after work. 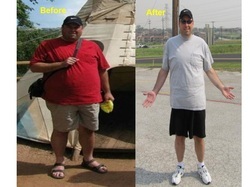 · The weight loss has helped me reduce the strain on my knees and hips. I have had replacement surgery on both knees and the left hip and the weight loss has made walking easier and climbing stairs is not as much problem as it once was. · Since surgery, I have noted that the weight loss seems to be associated with an increase in energy that I have to do everyday activities. I find I don't sleep as much or spent as much time in my easy chair as I did before the surgery. · Following surgery I have been able to reduce the amount of mediation I was taking for control of my blood pressure, control of gastric reflux and cholesterol levels. My goal is to reduce my weight to the point I can discontinue those medications as I feel that much of my problem has been my severe obesity. My family doctor has been helpful in providing me with advice and support in my goal of reducing the amount of drug I use to maintain stasis in my overall health. · In my research prior to surgery, I found several studies that showed patients who continued dietary counseling had better long term weight loss than those who did not. I think this is one area that I need to spend more work on and Kelli Janowki is a resource I would encourage you to use as you begin to modify your diet and establish a new way of eating. At this point in my recovery, I am about 50 pounds less than I was when I first began considering surgery. My goal has originally be a reduction of about 80 pounds but I think that I may try and continue to lose weight until I am more in agreement with recommended BMI for my height. For me, having the laproscopic sleeve gastrectomy was the right decision. I am 4 months post-operative and am doing well. I am losing weight, I feel good and seem to have more energy than before, my old “fattie” cloths are in a basket going to Goodwill and I think the reduction in weight will allow me to reduce the amount of medication I take on a daily basis. I would encourage people who are considering bariatric surgery to evaluate the laproscopic sleeve gastrectomy. There is nothing wrong with the Lap-Band procedure but I feel that there are advantages with a sleeve procedure and prospective candidates should review the literature and make a determination for themselves. If you have question or comment, please feel free to contact me and I can provide you with some of my experiences regarding this surgery. If you contact Kelli Janowski she can give you my contact information. Attached are a few of the studies I looked at when I made my decision. Many more can be found on the internet but these are a few you may wish to review yourself.